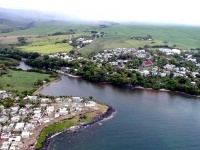 The small seaside resort of Souillac is situated along the rugged coast in the southern Savanne district. The appeal of Souillac lies in its scenery, as it is not a bathing spot. In striking contrast to the soft curves of the northern coastline, the high cliffs here drop abruptly to the sea to face the bracing winds of the Indian Ocean, which seem to blows all year round. The dramatic Gris-Gris cliffs are constantly smashed by waves (they are called the weeping cliffs - Roche qui Pleure - as a result) and tourists flock to the area to enjoy the rugged coastline. Souillac developed around, and was named after, the port built by the French, which gave the area strategic importance. Later, the English also relied heavily upon the port for the transport of trade goods, but after the introduction of railways to the island, in about 1877, the port gradually went into decline. Places of interest in Souillac for tourists include the Telfair Garden, which is wonderful for picnics, the old port area, the Gris-Gris cliffs, and the beautiful Rochester Falls. There are some great restaurants in the town and good accommodation for visitors. Souillac is special because it allows visitors to experience a different, wilder side of Mauritius.